It was a bucolic drive here, even the first portion, which was northbound on I5 being quite pleasant as I drove, first squeezing out of Peggy and Gerry’s driveway (They have a large driveway but as I am occasionally reminded, Bertha, our 5th wheel trailer, is big, very big, which of course is why we call her Bertha with apologies to anyone named Bertha who takes offense.) and on to Valley of the Rogue State Park where for the paltry sum of $3.00 we dumped our holding tanks and Elaine took over driving heading through the mountains to a rest area near the 7 Feathers Casino/Truck Stop at Canyonville and then it was Gordon’s turn for a few more miles on up the freeway to near Sutherlin and on to quieter roads, hwy 138 to Elkton where we stopped for lunch in the rig (we really wanted ice cream which did not see until we were done, and stuffed :-(, it was right across the road, and then hwy 38 to Reedsport where we turned south on US101 for about 8 miles to the park. There you have it, a prime example of why my 5th grade teacher called me the king of run on sentences and she definitely wasn’t complimenting me. I haven’t lost my touch. Even if we did not see anything else new and wonderful on this trip it would have been worth the drive for this campsite alone. We are up in an open area of tall forest well above the ocean, out of the wind, above the fog, but with a fog horn barely audible for ambiance, and not in the campground proper so that we have only one neighbor, a fellow work camper. As I was writing this a black tail doe walked through our site munching her breakfast. We are here for the whole month so we will have plenty of time to explore. 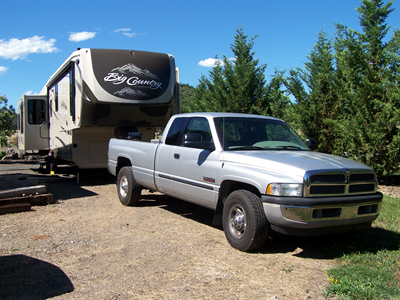 The campground is very nice and has a beautiful little lake with hiking trail all the way around it. 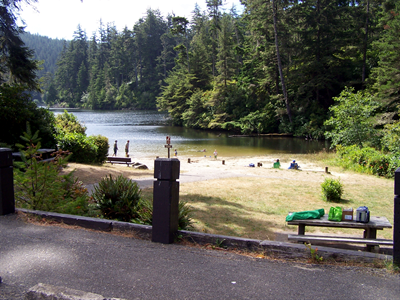 There is a day use area with lots of picnic tables and a sandy beach for fresh water swimming. And a wooded campground with tent sites, rv sites, cabins and yurts. 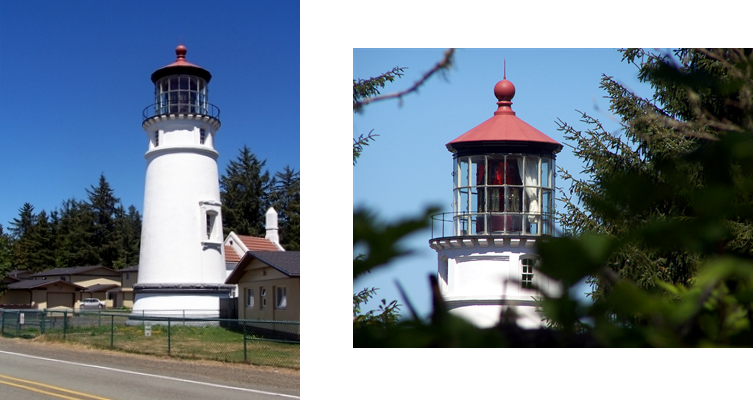 The lighthouse is just outside of the park and is run by the county. Note the unusual bi-color lens. 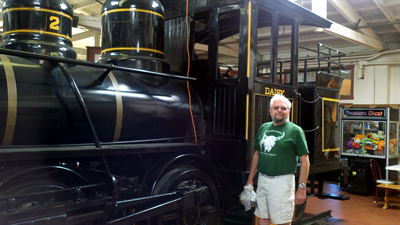 County volunteers give lighthouse tours, keep up a good museum of life and duties at the station and run a gift shop. We changed our minds, filling a vacancy here for another month, and cancelling our planned stay at Sunset Bay. Our site here is just too nice to leave. We will visit Sunset Bay on a day trip or two before we leave. So for now we are eating fresh seafood and fruit / vegetables from the local farmers markets. Elaine has made pickles and strawberry jam and keeps busy with crochet projects while Gordon collects mushrooms and does a little wood carving. I will produce another installment with highlights of our adventures in this area. So we will take pictures, and make notes and generally have a good time. We have begun planning our return to Arizona but as we have lots of time we will do both our planning and our trip back with leisure as the predominant feature. We do plan to go south and ride a jet boat on the Rogue River (it has been a long time and we still cherish memories of the first time) and then go back up to Corvallis to see family and then off to Idaho and down through Utah toward home. Will we do it that way? Maybe, probably, we will see, it is the plan for now. We really hated to leave Russian River but we have people to see, places to be, and commitments to keep. We did leave a day earlier than planned so that we could move along at a more leisurely pace. 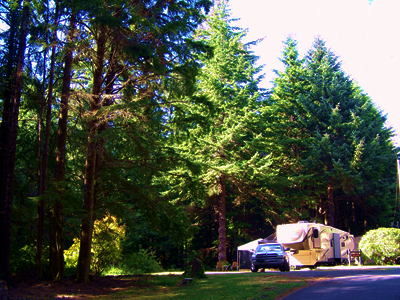 Our first stop, the unplanned addition, was at Ancient Redwoods RV. Ancient Redwoods is a very nice park run by some really great people. They have a very fine gift shop full of treen, home decor, and even some wooden jewelry. The tree behind Elaine proves that all of us are younger than spring chickens, as it is approximately 1,000 years old. It is only about 250 feet tall having lost the top 50 feet to a lighting strike. 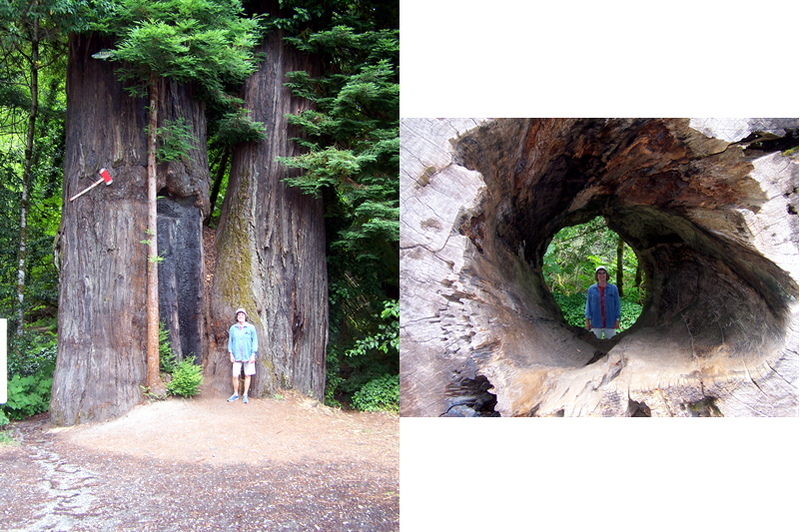 The main trunk diameter is 14.5 feet and if harvested there would be over 100,000 board feet of lumber. In the early 1900’s loggers started the process of falling her, see the scar near the axe, but were interrupted by a forest fire, see the black char on the trunk, and never returned. And then there was the flood of 1964. No wonder she has been named “Immortal Tree”. The other picture is an old hollow log section that people used to walk/crawl through. We only spent one night here in the middle of the Humbolt Redwoods but enjoyed it a lot. The next day we headed north again. Our first stop was at a small family run creamery in Loleta where we sampled many cheeses and finally bought some of their exclusive “Humbolt Gold” and some of their “Green Chile Jack” both of which I am sure we will enjoy. Back out to the highway and on north for a stop in Eureka where we were lucky enough to find a very long stretch of parking spaces right on highway 101. We hiked down a couple of blocks to the old part of town, took pictures of the harbor, and shopped our way up and down the street finding among other things an interesting used book store, a craft guild (unfortunately closed), a yarn and knitting store and numerous other places to poke around in. 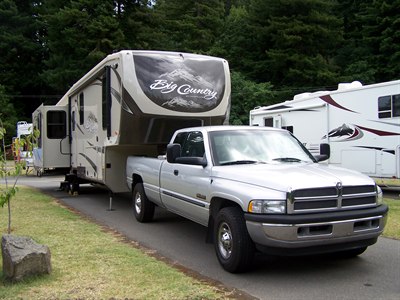 Soon we headed on toward the Klamath river, a few miles south of Crescent City, where we planned to spend a couple of nights. It was sunshine and blue sky weather when we arrived, but it all changed by morning. The next day while out shopping in the wind and rain I found a very nice piece of figured redwood which of course will add to the clutter until we get home. We did some necessary laundry and shopping and of course some unnecessary shopping. We also looked around a bit trying to remember where we had stayed the last time we camped here which was at least 20 years ago. Of course we only think we might have found it. Crescent City has, like most places, changed. 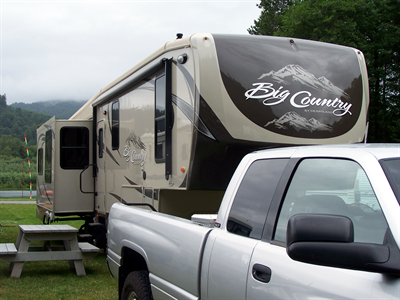 This is one great campsite here near White City and the host and hostess are wonderful. Sorry folks but this is an extremely exclusive place available by invitation only. We had a great time accomplishing nothing of importance for a few days. We did go to see the Crater Rock Museum which I will say is a must see place for anyone who has a little time to spare in the greater Medford area. I really liked the rock craft displays the most, but others might prefer the jewelry, the history, or the gem and mineral exhibits. Many small pieces of stone carefully cut and put together make up this exquisite coach model. 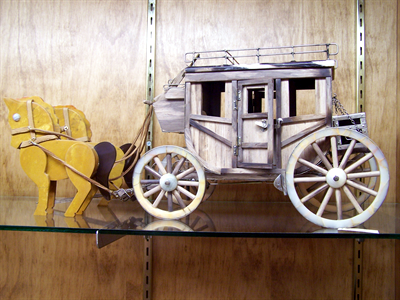 There are other wagons, a carousel, a ferris wheel, a diorama of an old west fort, another of an old west town, and more, and more. Peggy, Elaine, Gerry, and Gordon never get together without a little garage sale and or flea market shopping. We all found a little something to buy with my prize being a large block of pear wood that I got for free from a firewood pile. (Medford is well-known as orchard country and is the home of Harry and David, a world-famous purveyors of fine fruit.) 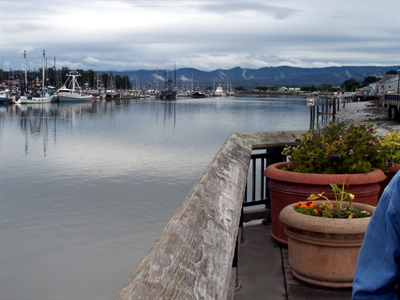 From here we are off to Umpqua Lighthouse State Park where we will spend the month of July. It will be nice to be stationary for a while. May you keep the shiny side up and the dirty side down. 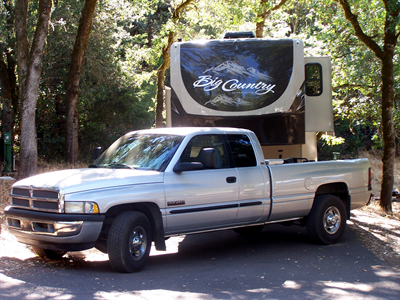 A nice drive west through the mountains, across the valley at Yuba City, and past Clear Lake on California Hwy 20 took us to US 101 at Calpella where we turned south toward Geyserville and the Naco / Thousand Trails Russian River Resort. There was a fair amount of road construction along this route but we persevered, stopping for craft supplies and misc. at a large mall in Yuba City, some fresh veggies at a roadside stand, and lunch in the rig somewhere near Clear Lake. When we got there our campsite was a little tight but worked out just fine. We had great neighbors and we enjoyed the enthusiasm of the youngsters playing ball nearby. On our first day there we shopped Ukiah (a couple of book stores, a yarn shop, and some misc. gawking), got fresh berries at a farm stand and some really good olive oil from a winery that also processed olives. The next day we headed for the coast where our first stop was the Point Arena Lighthouse. We could not have had better weather for a day of sightseeing. 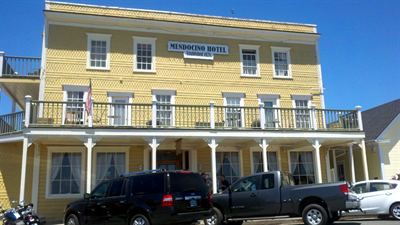 From there we went on to Mendocino, a beautiful and historic small town, perched above the Pacific. While in Mendocino we shopped a farmers market where we purchased beets with greens and got some advice on growing sprouts. Elaine also found a nice yarn shop so we spent a little time there before heading on up to Fort Bragg. 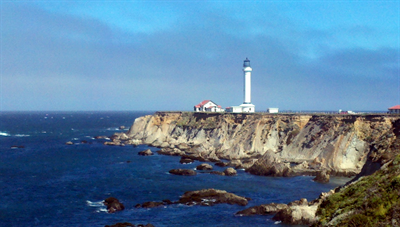 Fort Bragg is the business hub of the northern part of California Hwy 1. We checked out a few shops and bought some fresh caught rock cod for dinner before heading back inland. 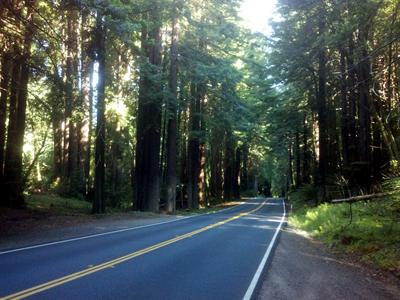 This is one of the many redwood groves that we drove through on the way back and forth to the coast. These winding roads and the beautiful weather made me wish for a little “top down” ’59 MGA touring or maybe riding a 50’s vintage 650 BSA. At any rate either one would have easier and more fun to herd down the road than a big diesel pickup. That aside we did have a marvelous day. The last day at Russian River we did a little looking around in Geyserville and got ready to hit the road again. We had planned to spend one more day here but decided to break up the drive to Medford, OR and drive up the coast on US 101 to California 199 and make it a 3 day drive instead of 2. Our only disappointment on this leg of the trip was that the Skunk Railroad was shut down due to a tunnel collapse. It would have been great to ride the old steam train through the redwoods.